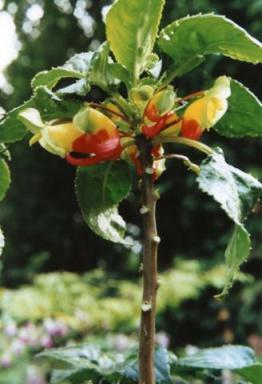 Upright perennial subshrub to 1 m high, most often with striking red-yellow-green flowers. Recently found occasionally naturalising close to where it is cultivated in New Zealand. The stems are thick and succulent, moderately branched, glabrous (without hairs), becoming woody and leafless below. The leaves are spirally arranged, petiolate (stalked), glabrous (without hairs or scales) or sparsely pubescent (some hairs), broadly ovate, ovate-oblong, elliptic or lanceolate, 5-22 cm long and 3-9 cm wide, with 6-12 pairs of lateral veins. Petioles (stalks) rather long, usually fimbriate (margin fringed with some hairs). Leaf margins crenate ( with shallow rounded teeth). 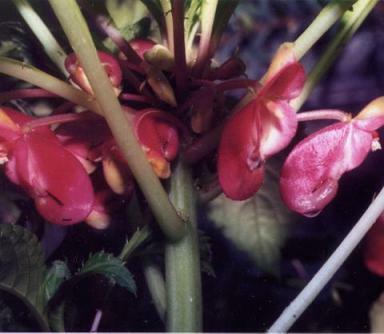 The flowers appear in fascicles (bunches or clusters) of 2-6 at the leaf-stem junction, often hidden under leaves. They could be red-yellow-green, sometimes purple with whitish petals, all purple, red or pink, 5 petalled, about 3 cm long. Upper petal cucullate (hooded), lateral petals united, rather small, so lower sepal is most conspicuous part of the flower. Flower stalks 3-5.5 cm long. Lateral sepals 2, small, green, 1.5-2 mm long. Lower sepal saccate (pouch-like), abruptly constricted into a sharply incurved spur. The flowers appear throughout the year. The fruit is an explosive capsule, 14-16 mm long and 5-7 mm wide. 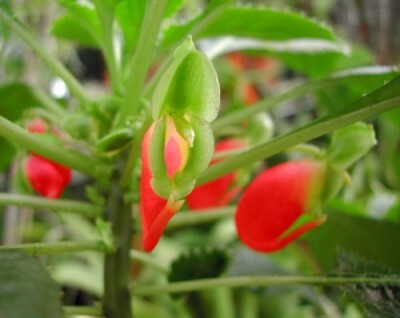 It can be distinguished from other perennial species in that Impatiens niamniamensis has a saccate lower sepal and flowers most often are a striking red-yellow-green, hidden under leaves. Whereas I. sodenii and I. walleriana have a shallow lower sepal, flowers in many shades of pink, red or white, clearly visible above leaves. 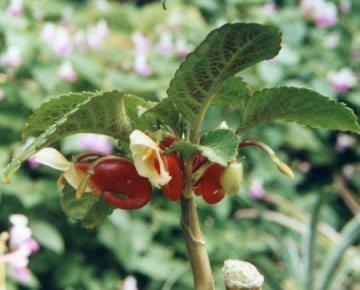 Policeman’s Helmet I. glandulifera, Kashmir balsam I. balfourii and I. balsamina are annual plants with flowers in shades of red, pink or white. Heenan P.B., de Lange P.J., Cameron E.K., Ogle C.C. & Champion P.D. 2004. Checklist of dicotyledons, gymnosperms, and pteridophytes naturalised or casual in New Zealand: additional records 2001-2003. New Zealand J. Bot. 42: 797-814.